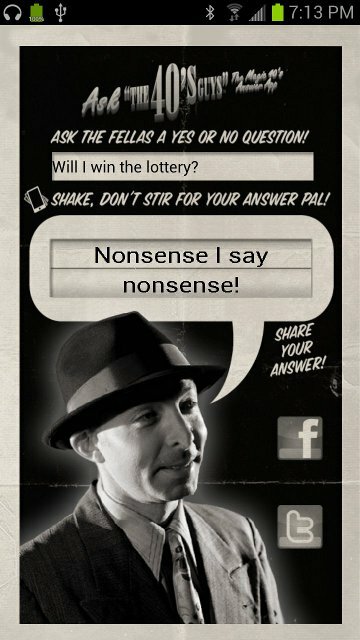 These are fun apps where the user types a question then one of the guys gives them a wiseguy style answer that is both animated and heard. 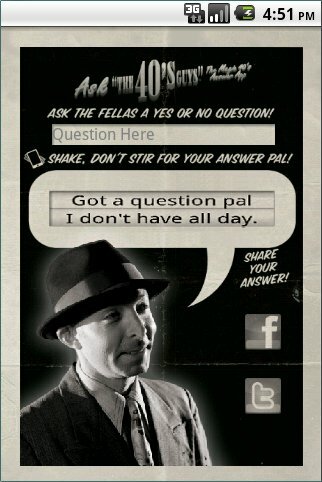 To find out more about The 40s Guys visit their website. On iOS screen size is rock solid. You know exactly what it will be, and can be certain items you place on screen will display as expected. The scale may change but the screen size is like a rock! On Android it is a totally different system. Screen sizes, scale and aspect ratio vary widely. Android handles this with a relative positioning scheme similar to how HTML pages display. Screen shots showing how image components are stretched to fit different screen aspect ratios and sizes. Notice that the face and the Facebook and Twitter icons are not stretched to fit the screen. These apps have the ability to Tweet to Twitter and to Post to Facebook. Facebook Posts are done using the Facebook SDK which have different versions for iOS and Android. Twitter has an SDK for Android but Apple has built an iOS library which makes Twitter very easy for iOS. To do the simple task of tweeting with an image or posting text with an image to Facebook can be surprisingly complicated with these APIs. As an example you can check out a post I made to StackOverflow.com about how to tweet in Android using the twitter4j library here. What's good about getting to know the interface is you have access to all the user data in these websites to enhance your application. Get the apps on Google Play and Itunes. No comments yet, but you could be the first. Copyright 2013 MindSpiker.com. All rights reserverd.